The north end of the Leelanau Trail is ready for the weekend. Bart was able groom in this afternoon from Suttons Bay to Shady Lane Rd. It has been groomed with the Ginzu groomer with tracks set, the warm up this past week help set the trail for a great groom and excellent skiing conditions. Grab your classic or skate skis and hit the trail, conditions are perfect for either. We were able get a groom in this morning as weather was warming up. Tracks are set on the trail from Suttons Bay to Birch Point Rd. We still don't have the Ginzu groomer up and running but I was able to use the small track setter to set some tracks. These should freeze up solid tonight and make for some great classic skiing. The skate lane is bumpy and could use some more work, which we can groom out when we get another snow fall. Grab your classic skis and enjoy the trail this weekend. I rolled the entire Leelanau Trail this afternoon.The green sled is running great and I am completing modifications so we can use the Ginzu. At this point we will focus on packing the new snow to build up the base. Michael Burns plans to go out tomorrow and continue packing with the roller. Conditions are good at the north and south ends of the trail. The trail between the South Cherry Bend parking lot and the Fouch Road parking lot are particularly good with full coverage and no icy spots. South from Suttons Bay is good, but there are a few icy patches. The mid section of the trail is fair, but there are many icy and a few bare spots in the high wind areas. Saturday Jan 10, 2016. Get out and ski! With the warm wet weather, we have obviously been unable to groom. The good news is our snowmobile repairs are going well. On Thursday, I worked with Jim Dombrowski to do modifications to our newly donated green sled that will allow it to pull the Ginzu. The yellow sled's repairs are well underway at Great Escapes Motorsports. Thank you Ron! It looks like continued wet conditions today, gradually turning to snow this evening. I expect to get out Sunday or Monday and roller the trail. It looks like we will be getting steady lake effect snow the first part of next week and we will groom the trail at some point as well as continue to pack it. Leelanau Trail - The mostly flat 15.5-mile Leelanau Trail runs from Traverse city to Suttons Bay. 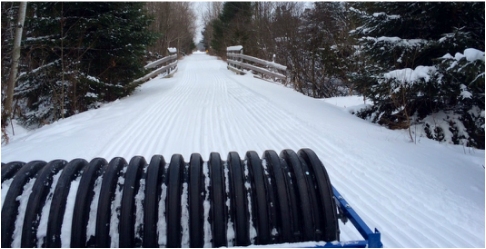 14 miles of the trail are groomed for classic and skate style skiing - from the trailhead at Cherrybend Rd. to the trailhead at 4th St. in Suttons Bay. In the summer, it functions as a bike trail. Three trail head parking areas: off Fourth Street in Suttons Bay and off Cherry Bend Road and off Fouch Road in Traverse City.